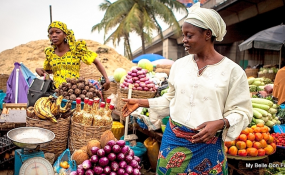 Indonesia — The three major economies of Africa: Nigeria, South Africa and Angola are projected to witness sluggish growth in 2019 and beyond, the International Monetary Fund (IMF) has said. While Nigeria will grow from 1.9 per cent in 2018 to 2.3 percent in 2019, South Africa and Angola were projected to move from 0.8 to 1.4 and -0.1 to 3.1 per cents respectively, the IMF said yesterday. The projected economic growth of the sub-Sahara Africa from 3.1 percent this year to 3.8 percent in 2019 is not enough to create the needed jobs for the growing population of the region, the Fund added. The Fund in its 2018 World Economic Outlook released yesterday also warned that the fragile growth of the region may not be enough for the attainment of the Sustainable Development Goals, if the trend remains for a while. He said although the region would witness growth next year but the growing number of working class coupled with less jobs opportunities, huge public debts and poor infrastructure present a challenge in achieving the developmental goals of the United Nations. "The continent could do much better once these economies are on the a more solid footings, particularly South Africa and Nigeria because they are really large and affect a number of countries in their neighbourhood." Milesi Ferretti, Deputy Director Research said while presenting the report. On the global ratings, IMF cut its global growth forecasts due to the trade tensions between the U.S. and trading partners. The Outlook said the global economy is expected to grow at 3.7 percent this year and next year - down 0.2 percentage points from an earlier forecast, as the trade war started to hit economic activity worldwide. Among emerging market and developing economies, the growth prospects of many energy exporters have been lifted by higher oil prices, but growth was revised down for Argentina, Brazil, Iran, and Turkey. Meanwhile, Nigeria and other African countries who are members of the G-24, are set to discuss debt relieve, disaster aid and crises prevention with senior staff from the International Monetary Fund (IMF) at the ongoing Annual meeting in Bali, Indonesia. Finance Minister, Zainab Shamsuna Ahmed who is the leader of the Nigerian delegation to the Annual General Meeting is expected to be part of the meeting. The Group of 24 (G-24), a chapter of the G-77, was established in 1971 to coordinate the positions of developing countries on international monetary and development finance issues and to ensure that their interests were adequately represented in negotiations on international monetary matters. The IMF had in April warned that not enough has been done to prevent future financial crises. Eric LeCompte, a financial expert and executive director of Jubilee USA said: "We are seeing growing debt crises in many developing economies, at the same time, we see risky and speculative behaviour on the raise. "We know that risky behaviour and unsustainable debt is a recipe for financial crises."